My toddler’s favorite animal is (still!) penguins. I thought it would be cute to make another Footprint Penguin Keepsake with him and chose to make a Christmas Towel. 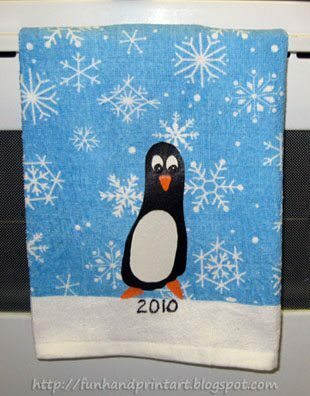 I found the towel at Dollar Tree and used Heat-N-Bond to adhere the penguin to the towel. 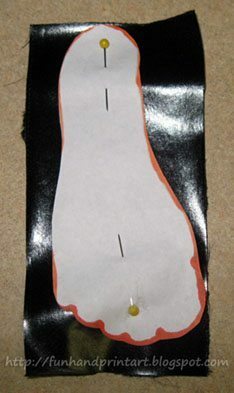 I made a template by tracing his foot onto paper & then cutting it out. 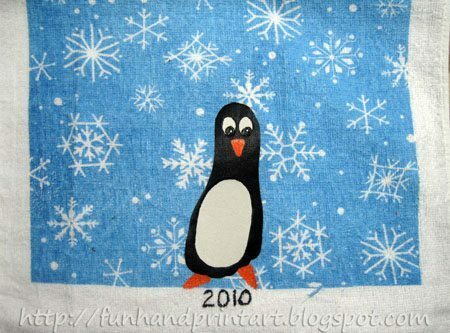 Then, I used scrap pieces of fabric to make the penguin body (the white belly is actually an old t-shirt!). Follow the instructions on the Heat-N-Bond; iron the wrong side of the fabric to the non-paper side of the Heat-N-Bond. After it has cooled, tear the paper off and pin the footprint template you made to the fabric (see photo above) and then cut around it. Next, iron the footprint to the towel. 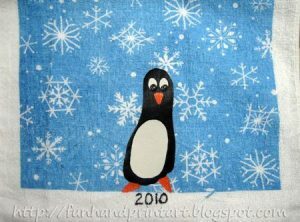 I did the same with a white fabric oval, which I then ironed on top of the black footprint to make the penguin’s belly and eyes. The eyes, feet, and beak are painted on. I finished by writing on the year. That is so cute and turned out great! !